I was cleaning up my disaster of a makeup table this afternoon and was admiring my latest favorite palettes and figured why not show them to you. I have been loving these palettes for the past week or two. 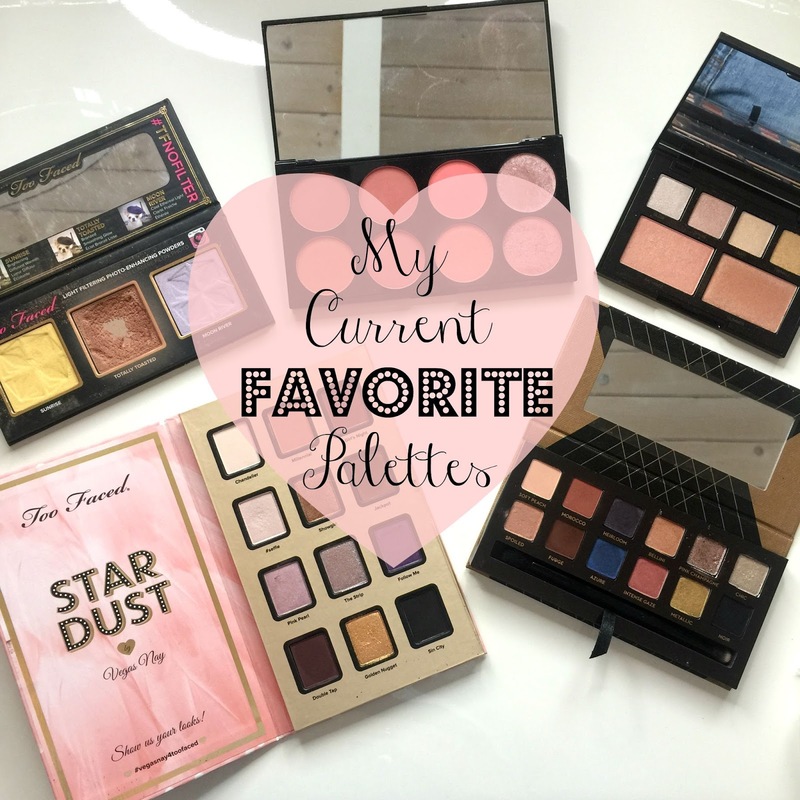 I love these so much and I think you guys should definitely check these palettes out! This palette is an absolute must have! You NEED this palette in your life. You really do. It's so beautiful. It has the perfect mix of mattes and shimmery shades. There's a little pop of color as well as some awesome neutral shades. I love that they are warm tones and the quality of the pigmentation is gorgeous. And then there is #Selfie. My new obsession as my brow bone, inner tear duct and highight for my cheekbones. I would buy this palette just for that color. Enough said. Maybe there is a theme here. I just like things named #Selfie lol. So this palette I only use for one thing. And that is for the bronzer color. Because this is supposed to give you that filtered look, this bronzer applies so nice and even that it just blends amazingly. It looks gorgeous on, is the perfect shade and gives you pretty glow without being shimmery. It's my favorite way to contour. I've hit pan so you know I love it haha! This is such a great blush palette for only $10! It's got great pigmentation and a beautiful variety of shades. I love the peachy pinky tones in this palette and the shimmery ones are really pretty to layer over the blushes. If you are looking for a palette and is affordable but doesn't lack quality... get this. This another really great palette. It has some great warm shades and some fun pops of color as well. Spoiled, Morocco, Fudge & Pink Champagne are my favorites. It's just an all around really fabulous palette. The quality is great and I think the price point is really good compared to other high end palettes. I love the size of this for traveling as well. It's super convenient and light weight. When I first saw this palette online I wanted it. Then I saw the price... then my smile turned to a frown lol. But then I thought, heck this is my job and justified buying it hahaha! It's WAY too expensive. However I have been loving it. The highlight shades are very pretty. They swatch chunky on the hand but apply very nice on the face. You can also use these as eyeshadows. I used radiance as a blush and it was gorgeous with a little bit of a coral blush over, as this one is very light and shimmery. Basically if you want to glow you would like this palette. However they are a little proud of this with the price. I would say it's worth maybe $35. $54.... it's a little much. But I do love it. Hope this has helped you decide incase you were looking at these palettes. wow I think I need that Makeup Revolution palette in my life, such a bargain too!